ROBBINSVILLE, NJ – Florence Township School District students now can bring their Chromebooks home to complete assignments, thanks in part to a $7,500 grant from the Investors Foundation. 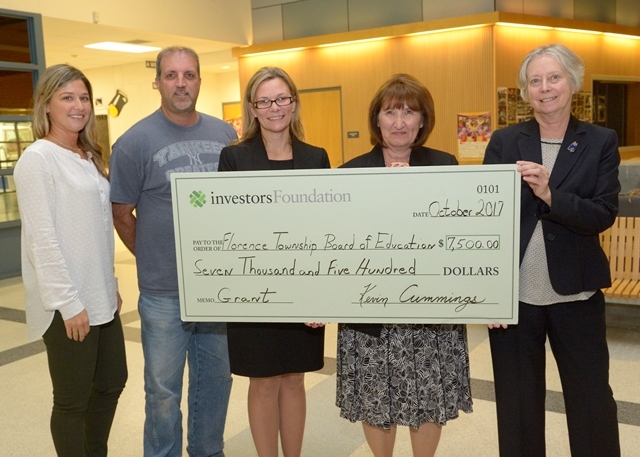 The Florence Township Board of Education applied for the grant from the Investors Foundation, which supports non-profit organizations that enrich the diverse communities served by Investors Bank. Since the 2016-2017 school year, the policy of the Florence Township School District has been to provide each student in third- through twelfth-grade with a Chromebook. Although students in the third- through sixth-grade only are allowed to use their Chromebooks during school hours, students in seventh- through twelfth-grade can take them home. Ambrosius noted that the opportunity for each student to have their own device at school and at home “will result in an overall enhanced educational experience, better student organizational skills, and will expand learning and sharing beyond the walls of the traditional classroom.” She said that greater use of technology, including the Chromebooks, will help make Florence Township School District students more competitive with other districts. “We are able to integrate more technology-based curriculum and course offerings that focus on all levels of education and abilities. The Chromebooks really enhance our ability to ensure the college- and career-readiness of our students,” said Ambrosius. Investors Bank Assistant Vice President and Florence Township Branch Manager Mae Heminway and Assistant Branch Manager Lois Hoffmaster recently presented the check at a public Board of Education meeting. Photo Caption: Members of the Florence Township Board of Education recently accepted a $7,500 grant from the Investors Foundation for carry cases for student Chromebooks. Pictured from left are Florence Township School District Business Administrator/Board Secretary Melissa Livengood, Board of Education Vice President Anthony Nutter, Superintendent of Schools Donna Ambrosius, Investors Bank Assistant Vice President and Florence Township Branch Manager Mae Heminway, and Investors Bank Florence Township Assistant Branch Manager Lois Hoffmaster.